Chicken Satay Spaghetti Squash Salad - What the Forks for Dinner? 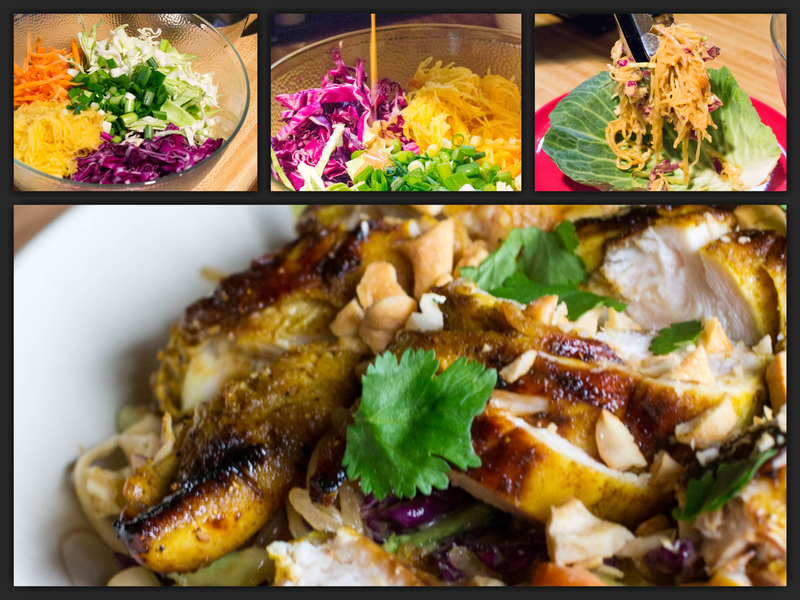 Chicken with yummy peanut sauce and spaghetti squash …… Chicken Satay Spaghetti Squash Salad. Satay is traditionally a shish kebab style dish popular in Indonesia and Thailand. It is most frequently associated with Thai food, where it is made from cubes of beef, chicken, or lamb, and is dipped in a traditional peanut relish or sauce. I mixed it up a little. First……no shish kebab. I marinaded chicken tenders in a curry, soy, brown sugar mixture. Tenders are are great and inexpensive part of the chicken…..bonus, they are easy to use, no cutting involved. I used spaghetti squash for a pasta like element. I love spaghetti squash……it’s healthy, easy to make, and lends itself to lots of flavors. Some colorful cabbage, carrots, and green onions , along with the spaghetti squash make the salad base. 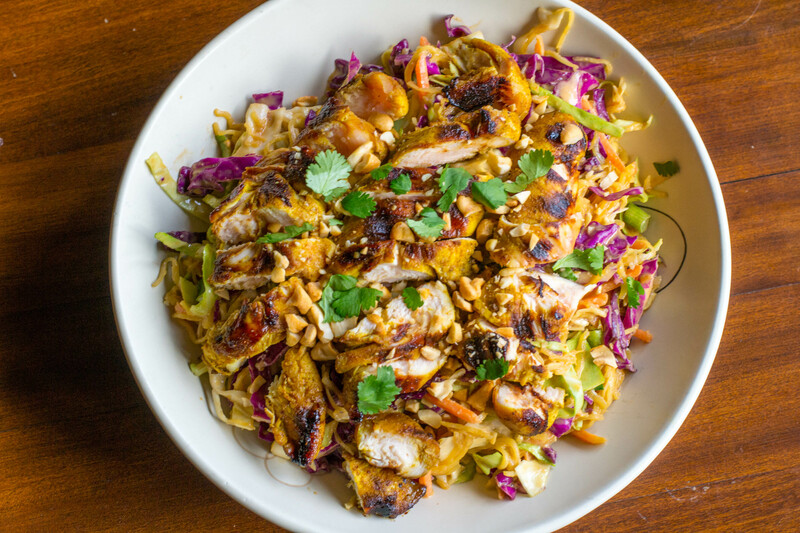 Peanut sauce, how do I love thee let me count the ways………slightly spicy, smooth, and peanut buttery, the perfect sauce for this salad. I grilled the marinaded chicken on a grill pan, but please use your outdoor grill if you can. 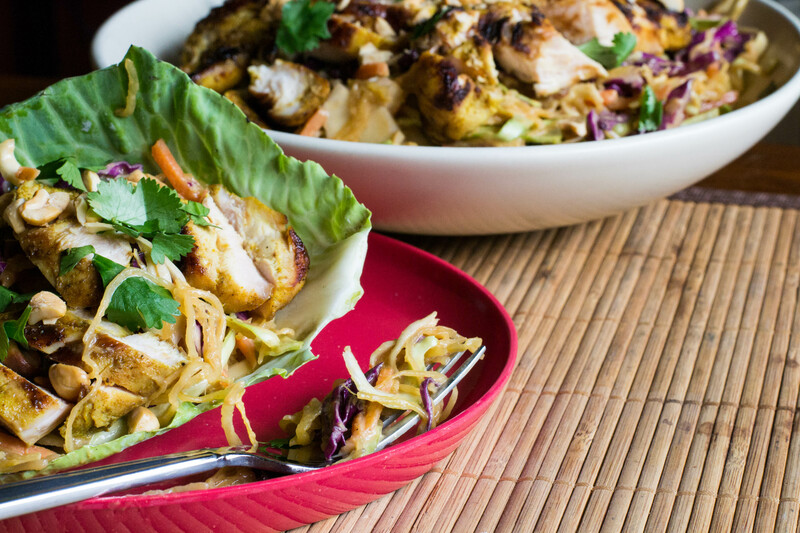 I tossed the peanut sauce with the spaghetti squash, cabbage salad base and topped with the grilled chicken after slicing it. Some cashews add crunch and cilantro a touch of green. This salad is good either room temperature or cold and makes it a perfect take along salad for a get-together or to pack as a work day lunch. 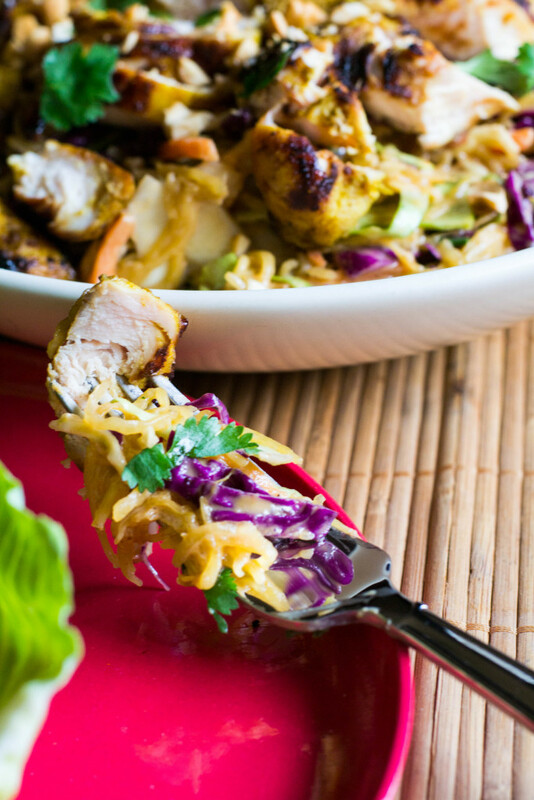 Use up that spaghetti squash that is setting your counter or get out and buy one……you need to make Chicken Satay Spaghetti Squash Salad. Place both cabbages, spaghetti squash carrots in a bowl, add ¼ tsp salt, toss to combine and set aside for 5-10 minutes to wilt lightly. Mix curry powder, soy sauce, and brown sugar until blended, add chicken tenders and toss to coat. Spray grill pan or skillet with coconut spray and heat over high heat. Cook the chicken for 3 minutes until golden, then transfer to a plate. Toss all salad ingredients with dressing. Slice chicken tenders and place on top of salad. 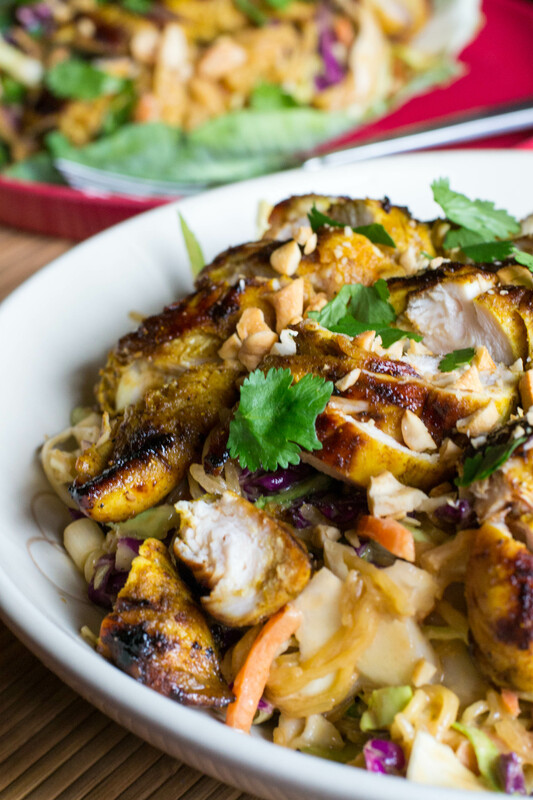 Garnish with cashews. Serve at room temperature or warm.